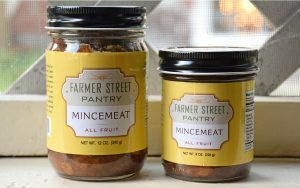 Enjoy Farmer Street Pantry All Fruit Mincemeat right out of the jar. Stir several spoonfuls into a cup of yogurt. Top oatmeal, pancakes, French toast, waffles. Layer onto turkey, ham or peanut butter sandwiches. With cottage cheese as a snack or side dish. Cheddar cheese & crackers or just crackers. Top a baked Brie, warm in oven. Serve with toast points. Super fast party fare: top a brick of cream cheese with a cup of mincemeat. Serve with crackers, cut veggies or fruit. Warm mincemeat to top ice cream or frozen yogurt. Use Farmer Street Pantry All Fruit Mincemeat in your cooking and baking. 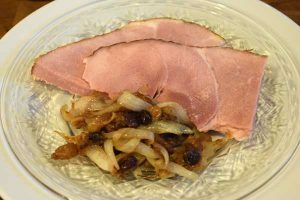 Side dish for pork, game, fish or poultry: Saute one chopped onion with one tablespoon chopped garlic in butter or olive oil until lightly browned. Add about one half to one cup mincemeat; stir until warmed. Finish with a drizzle of balsamic vinegar, 2 tablespoons chopped fresh herbs such as rosemary, marjoram, or parsley. Toasted pine nuts or sliced almonds on top. Add to stuffing for turkey. Add to stuffing for baked squash. 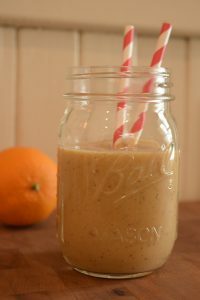 Orange and mincemeat are a delicious duo in this smoothie. 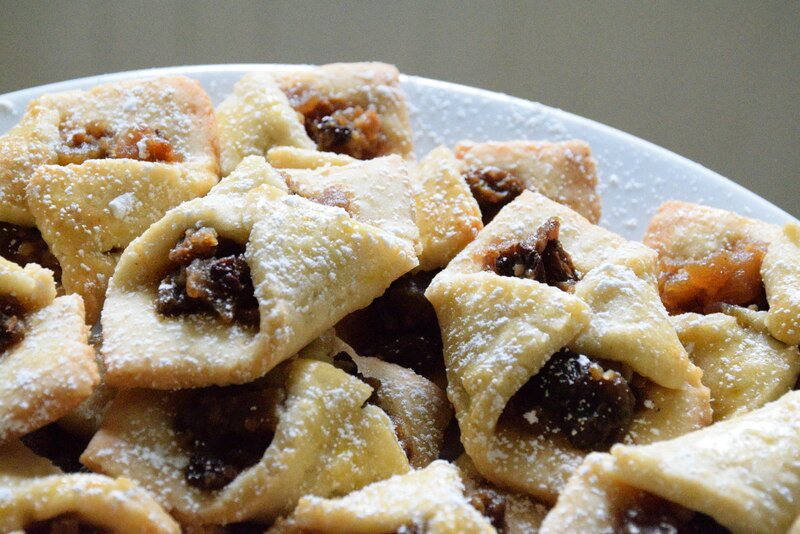 It’s a great way to use that little bit of mincemeat still in the fridge. ¾ c. regular or non-dairy milk or ⅓ c. yogurt mixed with ½ c. juice, milk, or coconut water. 2 Tb. frozen orange juice concentrate or reduce ½ c. fresh orange juice in pot on stove to 2 Tb. ; let cool. Optional: Add 1 tsp. 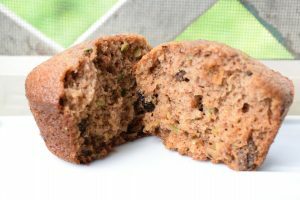 ground flax seeds or chia seeds. Substitute frozen banana chunks for the mango. Puree all ingredients in blender, food processer or immersion blender. If too thick, add a little more liquid. Pour into two 8 oz. glasses and serve immediately. Tender beans in a nicely spicy sauce enriched with dark beer flavor. Great for vegans or carnivores! ½ lb. (1.25 c. dried) dried Great Northern, pea, or navy beans, rinsed and soaked overnight (equals 3 c. soaked). OR use 2-15 oz. cans (3 c.) low sodium cannellini, pinto, or navy beans, drained. Prepare dried beans: rinse, soak overnight, drain, place in pot, add water to cover by at least one inch, cook until tender, approx. 30 minutes, drain, reserving 1 c. bean cooking liquid. Omit this step if using canned beans. While the beans are cooking, purée the mincemeat with half of the broth using an immersion blender or food processor. Chop the onions and garlic, and measure the remaining ingredients. Stir together the salsa verde, tomato paste, vinegar, mustard, and soy sauce. 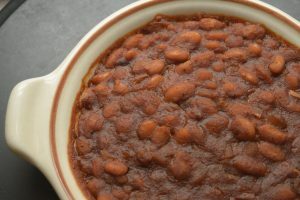 When the beans are done cooking, drain them (reserve 1 c. liquid) and place in a lidded casserole dish or cast-iron enameled pot that can go over a stove flame. Preheat the oven to 275° F. Add to the bean pot the mincemeat purée, beer, remaining broth, chopped onion, garlic, salsa verde mixture, and salt. Stir, cover, and bring to a simmer on the stove over medium heat for 10 minutes, then transfer the bean pot to the preheated oven. Bake for 2 hours then check the beans. If the sauce is very liquid, remove cover. If dry, stir in reserved bean cooking liquid (or extra broth or water) and put cover back on. In either case, bake for an additional 30 minutes. Serve hot or re-warmed. 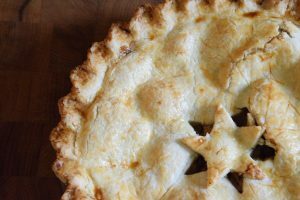 Mom’s apple pie filling and FSP Mincemeat come together in this spicy ode to the apple. The crust is brought to you by Aunt Chick’s Pies of 1938. Makes one 9-inch double crusted pie. Cut together the flour, shortening and 1 ½ tsp. salt until the shortening is pea sized. Add the milk; mix until there are no dry spots. If too dry, add more milk. Form into two balls, wrap, flatten into disks and refrigerate until firm enough to roll. Roll out on floured surface to one eighth inch thickness. Line a 9-inch pie shell. Roll out the second disk. Pre-heat oven to 425° F.
In a bowl, toss the apple slices with lemon juice, pinch of salt, 1 Tb. flour, sugar and spice. Place half of the apple slices in the bottom of the pie shell. Spread the mincemeat over the apples. Arrange the remaining apples over the mincemeat layer. Roll the top crust onto the rolling pin and unroll over the pie. Trim and crimp the edges, cutting vents in the top crust. Bake at 425° F for 15 minutes, then turn down to 350° and continue baking for another 30 – 40 minutes. Remove and cool on rack. Cream together shortening and sugar. Add eggs, one at a time. Add vanilla. Stir in the flour and baking powder until just combined. Cover dough in plastic wrap, press into a disc and chill at least one hour. Dough will be delicate: flour it well and roll into a rectangle between two sheets of parchment or wax paper to 1/8 inch thickness. Cut dough into 2 to 2½ inch squares. Place a rounded tsp. of mincemeat in the center. Bend two opposite corners over the filling until the tips are crossed; pinch together. Place cookies on two parchment-lined baking sheets. Bake in a pre-heated 350° F oven for a total of 20 – 25 minutes until edges and bottom are golden brown, rotating sheets halfway. Do not over brown. Cool on racks. Dust with a little confectioner’s sugar. You’ll need two glasses, 6 oz. to 10 oz. in size. Into each glass, put 2 Tb. of applesauce, then 2 Tb. of granola, then 2 Tb. 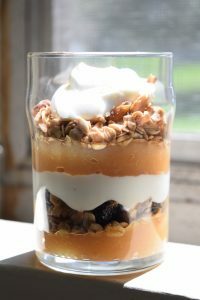 of yogurt spread to the sides, then granola, continuing to alternate the layers to the top. Finish with a dollop of yogurt and a sprinkle of spice.